June is nearly over, one month of summer gone. But its last two weeks were beautiful, warm and sunny in this part of the world. Let's hope July and August bring the same. Here are a few pictures taken around the Mount during the past week. 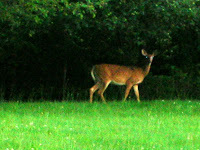 Here's a lone deer that frequents our backyard daily. 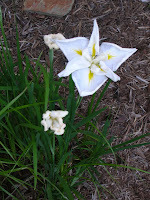 Found this white flower in the back of the house, in a corner all by itself, blooming beautifully. 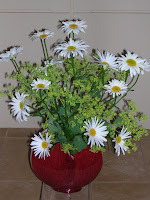 This delicate arrangement of daisies stayed alive all week after its use as part of the Sunday environment. It's in one of Brother Thomas's pots. Some eagles nest on our Presque Isle State Park and have often been seen over our property, flying up along our creek or in nearby neighborhoods. One of our oblates caught this photo as one flew right over her yard. Spirituality is that dimension of living in which we are aware of God's presence....I once knew a man who was in psychoanalysis. His doctor's office was across the street from an old, red-brick inner-city psychiatric hospital. One day, as he had regularly done for a few years, my friend walked down the street to his car in front of the hospital. Suddenly he heard a blood-chilling scream from the top floor. This unforgettable noise etched into his soul. The following day, back on the couch, he told his doctor of the scream from the top floor. To his astonishment, his therapist was surprised that he should mention it at all. "You mean you just now heard it?" asked the doctor. "After all these years? On the top floor that's where they put all the screamers." And from that day on, my friend said, he was able to hear the screams on the top floor almost every time. "The screams are all around us," he later mused, "waiting for our ears and eyes and hands."